What is going on? The generation on the eastern bank of the Indus who was born after Zia’s period has never seen anything like this in their entire lifetime. And ironically, this is the generation that is standing up the most in dissent. Are they insane? Their world view has been shaped by the ideals of Western democracy and is inspired by the recently concentrated focus on social justice. How can the activism triggered by these values be reconciled by the fact that they have been brought up in a faux democracy that has a violently grim history? Well, nothing has changed as far as the Pakistani state is concerned. Except for they are not afraid anymore. Or so it seems to us, clueless commentators. The revolution of dissent inspired by the Pashtun Tahafuz Movement has even taken overnight arrests to the heart of Punjab. Of course, it has happened before the last time the PTM decided to hold a rally in the provincial capital of Punjab following the killing of activist Arman Luni. This time around, Dr. Ammar Ali Jan, a Cambridge educated progressive professor of Punjab University from Lahore, was apprehended at the strike of dawn from his residence. Ammar Ali Jan was later released and he articulated his ordeal in a column demanding for a new social contract. Dr. Ammar Ali Jan was not the only facing the wrath of the authorities. This time the arrest was supposed to make more legal sense when Rizwan Razi was picked up from his home, in classic detention style by the FIA wing under the Cyber Crime Law passed under the last PML-N administration. While I and many prominent bloggers and journalists had a feeling what this, for which the previous administration, as well as the PPP controlled Senate needs to take full responsibility (although, of course, the terms were dictated from the bureaucratic state) but it’s sad how the assault on free speech has been meticulously legislated in Pakistan. So what’s next is the question. Banning twitter and facebook in Pakistan? We know these websites have been temporarily suspended from user access in Pakistan before. We also know that our state institutions have an army of trolls to defend the ideology of the state as well. But something on the lines may be days away because of the latest threat by the Ministry of Information, warning of strict action. Unfortunately, we have a similar history of repression of political free speech throughout the history of Pakistan. Only recently the memo case against the former ambassador in exile, Hussain Haqqani, was dropped from the courts. That case was simply going nowhere and the court ended the hearings because the petitioners themselves were not interested to show up. The court simply concluded that the government should proceed against the Ambassador if it wishes to do so. Haqqani is known for his sharp anti-establishment political views about Pakistan and currently heads the Hudson Institute in Washington DC. Despite the hostilities at home, he remains committed to a free and democratic Pakistani society. But that is not possible without civilian supremacy and a transparently functioning democracy in Pakistan. I know that the buzz is all about the India-Pakistan border conflict but these things also marked a very dark February in 2019. Just when you thought that the Pakistani state could not stoop any lower, it surprised you with its latest achievement. Although you really shouldn’t be surprised and probably many were not when they learned about the arrest of human rights activist Gulalai Ismail. Gulalai is a young Pashtun woman who has been vocal about women’s digital rights and free speech and has been recognized for her contribution abroad as well. The cause for Gulalai’s arrest was her support for the Pashtun Tahaffuz Movement (PTM) led by Manzoor Pashteen, who has largely been dubbed as a traitor by the Pakistani state establishment. Gulalai was arrested immediately on her arrival in Islamabad from her tour and her name was put on the Exit Control List, a blacklist supposed to prevent citizens from traveling outside Pakistan. While she has been released on interim bail, the case against her by the FIA stands as her home in Swabi was also raided for her arrest. Gulalai is a well-respected figure not just in Pakistan but globally for her work in human rights. Founder of NGO Aware Girls, focused on women’s rights and leadership, she has received the Chirac Prize for conflict prevention in France and there was no wonder it wasn’t long before Amnesty International was calling for her release. It only goes to show the impunity of the Pakistani state and their sheer disregard of not even sparing human rights activists of an international repute. You can only imagine how the authorities must be treating more obscure political dissenters and human rights activists. You can accuse people like Malala and Gulalai of privilege as compared to their fellow citizens, even though that would be unfair, but figures like them become symbols of resistance when the struggle of the common man goes unnoticed. The way the Pashtun population has been treated in recent years, especially since the recent Swat and Waziristan operations and the APS incident, has been a disgrace, to say the least. They are particularly discriminated against at military check posts and the way the Punjabi establishment has been painting non-violent grassroots leaders like Manzoor Pashteen as terrorists in their public broadcasts has been simply unacceptable. Such an ad has been airing of late and the embarrassed Punjab government was forced to pull it off. The Pakistani state must seriously reconsider the way it treats its citizens and must put an end to its long history of undemocratic authoritarianism if it wants democracy to flourish. That clearly has not been the goal of the civil and military bureaucratic establishment in the country. Pakistan must keep in mind before lecturing other countries on human rights. Democracy is a very difficult ideal to pursue in Pakistan. And one that is much needed to because of many of even its urban educated people being completely oblivious to its aspects that ensure fundamental rights. However, they are well aware of their right to exercise their vote. They realize the importance of their voice and using that strong . And probably the older generation and rural population are more aware of this right than the cynical and disillusioned urban educated class with all their privilege. With the presence of a bureaucratic deep state that undermines elected officials at each stage and propagating against them to the general public, we are about to witness the second consecutive civilian administration transferring power in Pakistan’s history. This election was sadly seen as a civil war between those who are for and against state establishment elements. Depending on tonight’s election results, we will supposedly get a referendum on the Panama verdicts and the prison sentence of the Sharifs. But let it be PML-N, PTI or PPP, the good news is that we are inching ahead with our democracy. And I hope that if the PTI wins, it makes a coalition government with the PPP and emphasize on collaboration instead of excluding dissenting elements. Despite all the measures that the so-called “caretaker administration” and the judiciary have taken to undermine the incumbent PML-N for the anti-establishment stances taken by Nawaz Sharif and Maryam Nawaz, the results of this election should be unanimously accepted. Despite all the arrests of PML-N workers on the night that Nawaz Sharif and Maryam Nawaz unexpectedly returned to Pakistan to accept their prison sentence, despite the midnight sentence against Hanif Abbasi, despite the official orders to curb the coverage of PML-N campaigns, despite all the delayed voting processes, the results of the elections must be unanimously accepted. Despite the widespread reports of military backed engineering echoed all across international media, it is important for us to unanimously accept the results of this election. That is the best way forward for us, despite the fact that we have never seen darker and more sinister censorship from the military and bureaucratic establishment in Pakistani politics and media in decades. The silver lining is that a leader from Punjab has taken a stand against the military establishment and for the first time in the history of the country, voices of dissent and resistance have risen from the heartland of the military establishment. This resistance for a better democracy must not go down. It is the way to a fairer, secular, and more democratic constitution. The latest provocative Dawn story about the CPEC might as well be a pack of lies but what about things unfolding right in front of our eyes. It is very hard, and almost feels immoral, to remain silent at the Interior Minister’s crusade against dissenting bloggers and social media activists. Since Zia’s period, we have not seen the Pakistani state practice such blunt and open crackdown against free speech and dissent in the countries. What are you to say of authorities who treat their own citizens, whose taxes pay for their livelihood, like the enemy? There is a reason why people are skeptical of China. The Chinese Road and Belt initiative does sound very good to the ears and who in their right mind would oppose economic cooperation beyond borders? But the reason why people find it hard to trust them is because of the political culture and ideology they practice in their country. They do not practice the freedom they have preached in this initiative. There are no Google and facebook in China and that is precisely why I am not too excited about the cross border optic fiber cable network from China border to Rawalpindi. The Chinese ideals are not shared by the Pakistani youth struggling for freedom of expression. The Chinese cultural push in Pakistan also sounds more than just a rumor, with their political culture seems to be creeping into the country. You see, in Pakistan people like to dissent, even when it comes to the blasphemy law. They like to vote for other parties, speak ill of the people of other sects and ethnicities. And considering the totalitarian trends that are also creeping into Pakistani politics with unanimously passed constitutional amendments, it is important to remind that we are not a one party country and would never be no matter what happens. It is only sad to see that these values of the Pakistani people are not being shared by those cracking down on dissenters. We can only beg our higher authorities to please think about the people of Pakistan above everything else and stop crackdown on dissenters. Ever since the CPEC has started, the government has been responding very aggressively and reactively to any criticism, without trying to understand what the concerns might be. In good conscience, you cannot possibly support that, especially when the democratically elected officials stand behind such policies. China may genuinely have a very encouraging vision of the regional economy but the questions that the local Pakistani businessmen and cultural critics have are worth listening to. The Pakistani dissenting bloggers may criticize or insult the Pakistani armed forces all they want, at least we knew that their higher echelons appreciated finer things in life. At least they valued some freedom for themselves, some of which trickled down to us mortals. But with an authoritarian influencer in the picture, are we even going to have the little freedom that we used to enjoy? The future looks uncertain and scary. Also, please do not mistake these lines to be a contradiction to the title of this piece. The more frightening aspect is that now the Pakistani authorities do not even fear if their reputation gets affected by openly targeting dissent. And that is precisely the effect of the CPEC. Consider this and all the pieces to come from hereon to be heavily self-censored. While I did expect that it would happen one fine day, but just when I was done with an overdose of patriotism with the March 23 parade, I found out that my blog was not a safe surfing area for people living in Pakistan anymore. Of course, I was not receiving any special treatment and it was wordpress.com which was blocked, and along with it hundreds of other Pakistani blogs. From what I read in the papers, it was because of national security. No confirmation from the PTA, but apparently it was just another of those switch on and off episodes. Nothing to worry about. Perhaps the Pakistan Telecommunications Authority is either incompetent, or is being malicious on purpose. The PTA has become an out-of-control psychotic. Or if that sounded too harsh, probably more like a bored baby with a dangerous toy in his hands, with rather juvenile and cute, but obnoxious antics, only with potentially dangerous consequences. The idle and overly concerned bureaucrats in this government body, which probably should not exist in the first place (at least the department of censorship), must invent new things to keep themselves occupied and feel purposeful about themselves. We often hear political parties make big fuss about public infrastructure and welfare projects being a waste of money for partisan reasons, but no one ever bothers considering these bureaucratic agencies, not to mention completely useless organizations such as the Islamic Ideological Council, a burden on the poor taxpayer. They are just drawing salaries out of your tax money, and they need to be there because, well, they are a part of the government. But there is an even more dangerous question to ask. How far will our government go in curtailing our civil liberties and access to information in the name of national security? Sadly this question remains as unanswered in advanced democracies such as the United States and the EU, as it is in countries with almost theocratic preoccupation. So why bother. Despite the tendencies among the Pakistani people to accept every single state absurdity in the name of national security, they do come across as pretty freedom loving. So would they be willing to give up facebook one day in the name of national security, decency or for the protection of all things that are holy? Or would that trigger a riot for the demands of their beloved social media platform one day, with the likes of the Jamaat-e-Islami leading it? Only time will tell. I really do hope we live to see that day. Wishful thinking. Though the question of the temporary blocking of wordpress.com should not go unanswered. We should demand a response from the PTA, who should explain to the Pakistani people why they take them for an intellectually challenged group. Why do they believe that blocking words of dissent on one platform would prevent the people from its harmful effects? And that if they are curious, they can always find ways to reach such information. Why is Pakistan trying so hard to become China? I am not even sure if our other horrible ideal, Saudi Arabia, practices this much internet censorship. We often find our political experts singing praises of the responsibility which political party leaders such as Prime Minister Nawaz Sharif and President Zardari have shown in coming together over issues. While there is no denying that Pakistani politicians have certainly learned their lessons as far as preventing the suspension of the constitution is concerned, the kind of consensus that we have been seeing of late is hardly doing democracy any favors. Some would say that veteran politician Raza Rabbani has proved to be a great hero for democracy for speaking his mind about voting against his conscience during the passage of the 21st amendment in the Senate. He is certainly a hero for democracy, but hardly for simply shedding tears when his constituents waited for him to do the right thing, at least in his view. In the end, it was his vote that would have made a difference, albeit at the cost of the seat of Chairman Senate. But the heroes that I am talking about are the ones who are condemned and cornered by their parties and are pressured every election season to follow the party leadership. No one is opposing a little whipping every now and then, but when the Prime Minister writes to the Election Commission for suspending the membership of an MPA for voting for the Senator of another party, you know that things have gone too far. Similar is the case for constitutional amendments preventing voting against party liners. 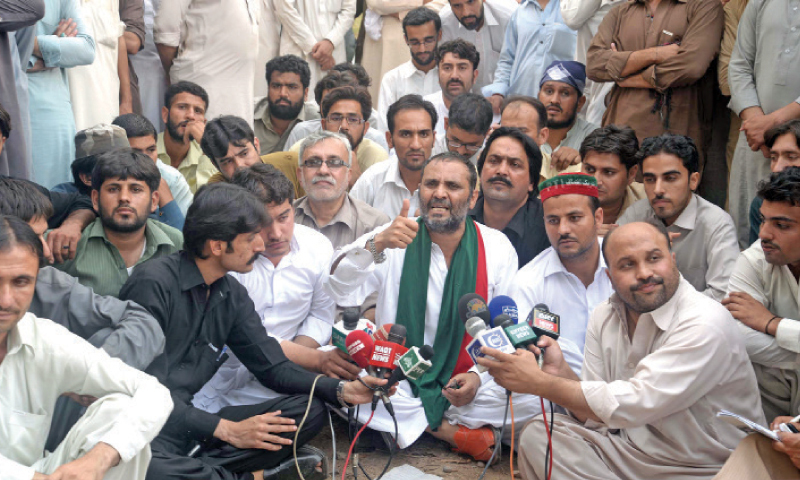 People such as Javed Naseem of the PTI, who has been thrown out of the party for issuing dissenting statements against the alleged corruption of the party leadership (treatment of own medicine), and Wajihuzzaman of PML-N, both from the KP Provincial Assembly, are lone warriors for the fight of the rights of the individual legislator. Same goes for many more individual MPs, such as Jamshed Dasti, breaking away from their political parties for whatever reasons they had to give. The greatest damage that the party leaders are doing to the very fragile democracy in Pakistan is to try blocking individual vote of dissent in party lines in the name of preventing corruption. Just the very mention of the expression “horse trading” triggers a knee jerk reaction from the media and the people alike, limiting the individual delegate’s choice and influence. We must remember that the claims and allegations of corruption are not its proof, and a politician who switches parties is not necessarily corrupt. The need of discouraging “horse trading” stems more out of political parties protecting their investment than looking after the interest of the people or penalizing corruption. The greatest example of such suppression of individual legislators could be witnessed in the recently concluded Senate elections. Even though all parties try blocking independent voting within their rank and file, two have been at the forefront for proposing amendments to the Senate election procedure. PML-N and PTI were all for changing secret ballot to open show of hands, only to be blocked by the PPP & JUI-F. While there is no harm at all in open voting, it is also important to understand the motives of the political parties supporting the proposed 22nd amendment. This is probably to discourage what little hope individual MPs have to vote for the candidate of their choice, even if they are not from the same party. What our party leaders are now happy with is the absolute consensus for passing controversial constitutional amendments and electing the Senate Chairman unopposed, as long as their orders are obeyed. Party discipline. Actually secret ballot hardly even matters as dissenting members of the legislature are pressurized by their parties already. However, open voting works well in legislative systems where members are not threatened with suspension for voting as per their will. In Pakistan, the entire purpose that it would serve for now would be helping the media figure out which Senators from other parties voted for Shibly Faraz, the PTI candidate for the position of Deputy Chairman Senate, over Maulana Abdul Ghafoor Haideri, the cleric backed by the consensus of secular parties.